Rachel Homan won her second Canadian women’s curling championship on Sunday night, defeating Val Sweeting of Alberta 8-6 in the final of the 2014 Scotties Tournament of Hearts played at the Maurice-Richard Arena in Montréal. “It was not an easy game,” she said. “They (Alberta) made us work for every point we got. 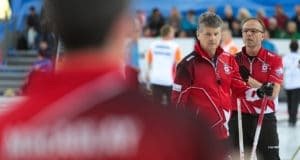 Team Canada – Homan, Emma Miskew, Alison Kreviazuk, Lisa Weagle, alternate Stephanie LeDrew and coach Earle Morris – took control right from the start, blanking the first end and scoring in the second when Sweeting’s take-out attempt just ticked a guard. Team Canada was able to draw for three, something Homan agreed was an advantage, but with risks as well. Sweeting drew for her deuce in four, but it was hard for the Alberta foursome to get any offence started against the powerful hitting of the defending champions. In six, trailing 5-3, Alberta took advantage of a Homan draw that slid too far. Sweeting put another rock on the button, but Homan threw one of her trademark big weight takeouts to scatter everything in the house and score two. 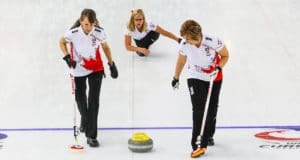 It was that kind of a game: Sweeting and her team of Joanne Courtney, Dana Ferguson, Rachelle Pidherny, alternate Renée Sonnenberg and coach Taina Smiley tried to place rocks in scoring position, and Homan simply went after them with her team’s powerful hitting. It was fitting that the last shot of the game was hit for the win. It was the second straight Scotties title for Homan and her team, who play out of the Ottawa Curling Club. 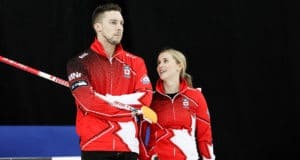 Homan, who also won the Sandra Schmirler Award as the Scotties MVP, reached the final after going undefeated in the round robin, and scoring a 6-4 win over Manitoba’s Chelsey Carey in the Page 1 vs 2 playoff game on Friday night. With the win, Homan and her team will move on to represent Canada at the 2014 Ford World Women’s Curling Championship, presented by Booster Juice, March 15-23 in Saint John, N.B. At the 2013 event in Riga, Latvia, Homan won a bronze medal, but she wants more.